This paper presents analysis and design of zero voltage switching (ZVS) active-clamped current-fed full-bridge isolated dc/dc converter for fuel cell applications. The designed converter maintains ZVS of all switches from full load down to very light load condition over wide input voltage variation. Detailed operation, analysis, design, simulation, and experimental results for the proposed design are presented. The additional auxiliary active clamping circuit absorbs the turn-off voltage spike limiting the peak voltage across the devices allowing the selection and use of low-voltage devices with low on-state resistance. In addition, it also assists in achieving ZVS of semiconductor devices. The converter utilizes the energy stored in the transformer leakage inductance aided by its magnetizing inductance to maintain ZVS. ZVS range depends upon the design, in particular the ratio of leakage and magnetizing inductances of the transformer. Rectifier diodes operate with zero-current switching. An experimental converter prototype rated at 500 W has been designed, built, and tested in the laboratory to verify the analysis, design, and performance for wide variations in input voltage and load. Fig. 1. Active-clamped ZVS current-fed full-bridge dc-dc converter. Fig. 2. Simulation waveforms at Vin = 22 V and full load: (a) voltage vAB, leakage inductance current ilk, and magnetizing inductance current iLm (b) main switches’ currents iS1 and iS2, auxiliary switch’s current iSax and voltage across auxiliary capacitor VCa. Fig. 3. Simulation waveforms at Vin = 41 V and 10% load: (a) voltage vAB, leakage inductance current ilk, and magnetizing inductance current iLm (b) main switches’ currents iS1 and iS2, auxiliary switch’s current iSax and voltage across auxiliary capacitor VCa. Fig. 4. 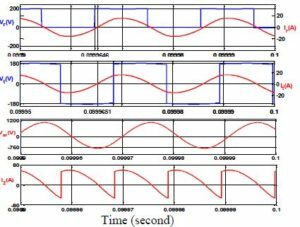 Experimental waveforms at Vin = 22 V and full load: (a) Voltage vAB (100 V/div) and leakage inductance current ilk (50 A/div), (b) main switch voltage vDS (50 V/div) and gate voltage vGS (10 V/div), (c) auxiliary switch voltage vDS (50 V/div) and gate voltage vGS (20 V/div), (d) main switch current iS1 (20 A/div), (e) auxiliary switch current iSax (20 A/div) and (f) magnetizing inductance current iLm (0.5 A/div). Fig. 5. Experimental waveforms at Vin = 41 V and full load: (a) Voltage vAB (50 V/div) and leakage inductance current ilk (50 A/div), (b) main switch voltage vDS (50 V/div) and gate voltage vGS (10 V/div), (c) auxiliary switch voltage vDS (50 V/div) and gate voltage vGS (20 V/div), (d) main switch current iS1 (20 A/div), (e) auxiliary switch current iSax (10 A/div) and (f) magnetizing inductance current iLm (1 A/div). Fig. 6. 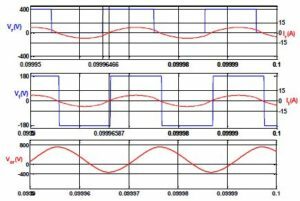 Experimental waveforms at Vin = 22 V and 20% load: (a) Voltage vAB (50 V/div) and leakage inductance current ilk (10 A/div), (b) main switch voltage vDS (50 V/div), gate voltage vGS (20 V/div) and current iS1 (10 A/div), (c) auxiliary switch voltage vDS (50 V/div) and gate voltage Vgs (10 V/div), (d) auxiliary switch current iSax (5 A/div) and (e) magnetizing inductance current iLm (0.5 A/div). Fig. 7. Experimental waveforms at Vin = 41 V and 10% load. (a) Voltage vAB (50 V/div) and leakage inductance current ilk (10 A/div), (b) main switch voltage vDS (50 V/div) and gate voltage vGS (10 V/div), (c) auxiliary switch voltage vDS (50 V/div) and gate voltage vGS (10 V/div), (d) main switch current iS1 (10 A/div), (e) auxiliary switch current iSax (5 A/div) and (f) magnetizing inductance current iLm (1 A/div). To achieve ZVS for wide source voltage variation and varying output power/load while maintaining high efficiency has been a challenge, particularly for low-voltage higher current input applications. A ZVS active-clamped current-fed full bridge isolated converter has been restudied in this paper. The magnetizing inductance increases the leakage inductance current value at light load and therefore the energy stored in leakage inductance to maintain ZVS of main switches as well as auxiliary switch. 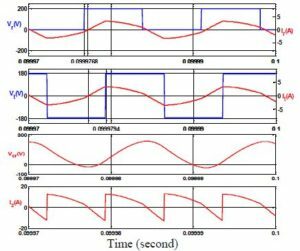 Detailed steady-state operation and analysis of current-fed full-bridge converter have been presented. Design to attain soft switching over an extended range of input voltage and load i.e., output power has been presented. Simulation results using PSIM 9.0.4 have been presented. An experimental prototype of. the converter rated at 500Whas been designed, built, and tested for variations in input voltage and load in order to validate the analysis. Experimental results verify the accuracy of the analysis and show that the proposed configuration is able to maintain ZVS of all switches over a wide range of load and input voltage variation due to the variation in fuel flow and stack temperature. Theoretically, the converter is able to maintain ZVS till 20% load at 22 V and 5% load 41 V.
In a practical fuel cell application, when the load current drops due to reduced fuel flow, the light or reduced power below rated power is transferred at higher fuel cell voltage. It can be clearly seen and understood also from the fuel cell V –I characteristic. If the load current or power is around 10% of the rated power, then the fuel cell stack voltage increases nearly to 41 V. Hence, the possibility of the condition Vin = 22 V at 10% load is only during transition period when load is suddenly changed from full load to 10% due to fuel flow adjustment. Hence, it is justifiable to have ZVS range of 20% load at low input voltage and below 10% at higher input voltage will cover the operating range at steady state. Rated converter efficiency of 94% is obtained for the developed lab prototype rated at 500 W. The converter has limitation that duty cycle of the main switch should be greater than 50%. S. Jain and V. Agarwal, “An integrated hybrid power supply for distributed generation applications fed by nonconventional energy sources,” IEEE Trans. Energy Convers., vol. 23, no. 2, pp. 622–631, Jun. 2008. Y. Lembeye, V. D. Bang, G. Lefevre, and J. P. Ferrieux, “Novel half-bridge inductive dc-dc isolated converters for fuel cell applications,” IEEE Trans. Energy Convers., vol. 24, no. 1, pp. 203–210, Mar. 2009. J. Mazumdar, I. Batarseh, N. Kutkut, and O. Demirci, “High frequency low cost dc-ac inverter design with fuel cell source home applications,” in Conf. Rec. IEEE IAS Annu. Meeting, Oct. 2002, vol. 2, pp. 789–794. J. Wang, F. Z. Peng, J. Anderson, A. Joseph, and R. Buffenbarger, “Low cost fuel cell converter system for residential power generation,” IEEE Trans. Power Electron., vol. 19, no. 5, pp. 1315–1322, Sep. 2004. R. Gopinath, S. Kim, J.-H. Hahn, P. N. Enjeti, M. B. Yeary, and J. W. Howze, “Development of a low cost fuel cell inverter system with DSP control,” IEEE Trans. Power Electron., vol. 19, no. 5, pp. 1256–1262, Sep. 2004.